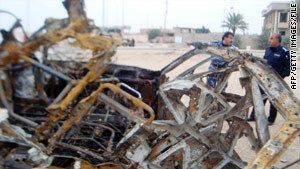 Iraqi officers look at the damage from a car bomb in Ramadi, Iraq, on December 30. Baghdad, Iraq (CNN) -- Bombers struck Thursday, killing seven people in two volatile locations west and north of Baghdad. An Interior Ministry official said at least six people were killed and seven others were wounded in a series of blasts in the Anbar province town of Hit, west of the capital. The official said attackers planted explosives in small fuel containers outside four houses. The bombings that killed the four men and two women were the latest to strike the region, once dominated by al Qaeda in Iraq. One of the houses targeted was the home of Col. Walid al-Heeti, head of Hit's counterterrorism bureau. He was not among the casualties. Anbar was a stronghold of the Sunni Arab insurgency in the early years of the Iraq war, but the region became staunchly opposed to al Qaeda with the emergence of anti-militant groups known as Awakening Councils. However, a series of attacks in the province, mainly in the two cities of Ramadi and Falluja, have sparked concerns about a resurgence of al Qaeda in Iraq. Last week, at least 23 people were killed and dozens more were wounded when bombers targeted government buildings in Ramadi, Anbar's provincial seat. One of those wounded was Anbar's governor. The Islamic State of Iraq, an umbrella group that includes al Qaeda in Iraq, claimed responsibility for the Ramadi attack. Meanwhile, in the Diyala province town of Khanaqin, north of Baghdad, one person was killed Thursday and 12 others were wounded in a double bombing outside a Shiite mosque. There were no casualties in an initial blast, but after civilians and police gathered at the scene, a second bomb detonated, killing a policeman and wounding a dozen more people, including four police officers, the ministry said. Khanaqin is one of the main territories under dispute between the central government in Baghdad and the autonomous Kurdish Regional Government. Many people in the largely Kurdish town want it to be part of the KRG and not Diyala province.